Ron Kitchens wakes up every morning driven by his passion that the greatest force for change is a job. Ron serves as the president and chief executive officer of Southwest Michigan First, a privately-funded economic development consulting firm. 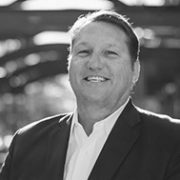 In addition, Ron serves as managing partner of Consultant Connect, general partner of the Southwest Michigan First Life Science Fund and is a board member of Impact Athletic. Ron is the founder of Catalyst University, a leadership “un-conference,” and the co-founder of Engage, an invitation-only leadership symposium for global economic development leaders. The best-selling author of Community Capitalism: Lessons from Kalamazoo, his Always Forward blogs and podcasts can be found at RonKitchens.com. He is a nationally sought-after speaker to business and professional groups on the topics of leadership, economic development, talent, wellness and team engagement. Under his leadership, Southwest Michigan First has been named to the list of the National Best and Brightest Companies to Work For four years running and, in 2012, was recognized as the Best Small Business to Work For in America by the National Association of Business Resources. In addition, Outside Magazine and The Wall Street Journal have lifted up Ron and his team on their lists of “Best Places to Work.” Southwest Michigan First has been recognized by the International Asset Management Council with their Annual Global Innovators Award and by Fast Company as one of its Fast 50. Ron and his teams have been extensively featured in national and international media outlets including The Wall Street Journal, CBS, NBC, Fox, USA Today, Forbes, Fortune, The Economist and National Public Radio. Ron is a graduate of Missouri State University, a Certified Economic Developer, has completed both the University of Oklahoma’s Economic Development Institute and Harvard’s Negotiation Program and is accredited by UCLA’s Corporate Governance Program. He is passionate about upland bird hunting, exploring new restaurants, boating and Truman, the world’s greatest Labrador Retriever. At home, Ron’s priorities are his wife Lyn and daughter Kelsey.